UMD chemist Prof. 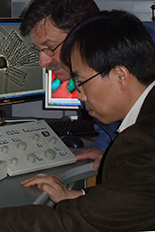 Sang Bok Lee (right) replaces materials scientist Distinguished University Professor Gary Rubloff (left) as director of the NanoCenter. Prof. Sang Bok Lee has been selected to serve as the next director of the University of Maryland NanoCenter (which includes the FabLab and AIMLab). Prof. Lee's 5-year term will begin on July 1, 2018. Prof. Lee will be replacing Gary Rubloff, who has led the University of Maryland the NanoCenter since its inception in 2004. Lee's research activities range from nanobiotechnology to energy storage technologies, including the electrochemical synthesis and characterization of meso-architectures, and the physical and chemical properties of porous nanostructures. Lee was welcomed by three UMD leaders who support the NanoCenter: Thomas E. Murphy, Professor and Director, Institute for Research in Electronics & Applied Physics; Darryll J. Pines, Dean and Farvardin Professor, A. James Clark School of Engineering; and Amitabh Varshney, Dean and Professor, College of Computer, Mathematical and Natural Sciences. "Please join us in congratulating Prof. Lee on this appointment, and welcoming him to this new role," Murphy and his colleagues said in a statement. "We would like to express our gratitude to Prof. Rubloff for his vital role in founding, establishing, promoting and leading this unique campus organization over the past 14 years, and to the search committee, led by Prof. Wolfgang Losert, Associate Dean of CMNS."